In cooperation with Educational Testing Service (ETS), RTU Riga Business School offers the TOEFL ITP® Test. 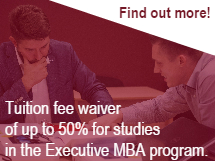 TOEFL ITP® Test is one of the entrance exams at the RTU Riga Business School MBA and Bachelor programs and your score must be 550 points or more in order to be considered for admission. In addition to the TOEFL ITP® you will also need to write the TWE (Test of Written English) essay. TOEFL ITP® Test is administered in English and the total testing takes approximately 3,5 hours. Results will be sent to you by e-mail 3 weeks after the Test and are valid 2 years. Official Score Report can be obtained at the RBS Information Center. N.B. Under the TOEFL® Institutional Testing Program (ITP), scores are reported to the institution administering the test and cannot be transferred to other instituions. If a candidates need TOEFL® scores for admission to universities and colleges, they must take the TOEFL® test (iBT or PBT).